Melendez Catering Services was founded by the Melendez brothers, Omar and Jose, in 2010. 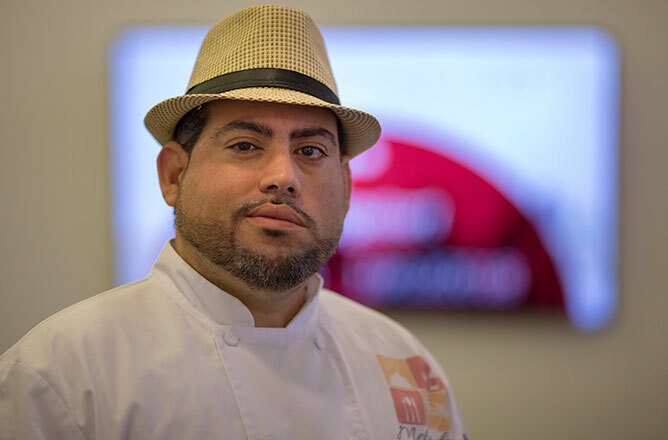 Over the past eight years, Chef Jose has expanded his menu to feature more elaborate Caribbean-style modern cuisine by taking American classic dishes and reinventing them with a Latin touch. Jose is also a part of JumpStart’s Core City: Cleveland Impact Program, an intensive business assistance program designed to support the development and growth of businesses located within Cleveland’s core neighborhoods. We recently sat down with Jose to discuss how he got started, what makes his business unique and how the Impact Program has helped him along the way. I was actually homeless and I needed to get an apartment, so I turned to what I know, which is food. So in a way, food saved my life. And, since we are the only caterers providing this type of Latin-infused cuisine in Northeast Ohio, so that makes us stand out from the competition. I was a semi-finalist for Cleveland Chain Reaction and after my presentation, some of the team members thought I would be a great fit for cohort six of the Core City: Cleveland Impact Program. 3. How has the program helped you so far? What have been the biggest takeaways? Connecting with JumpStart overall has been a great experience for my business. I thought I knew a lot, but when I came here, I realized there was a lot more that I didn’t know about. They have helped put me in a position where I can take my business to the next level. 4. What do you think is the most important thing Core City: Cleveland offers to entrepreneurs? Overall, I think the most important thing is the amount of help and knowledge it offers to help take your business to the next level. The amount of knowledge that JumpStart gives to the businesses. It’s truly impressive. Right now the business is still young, but by next year, we hope to have our own storefront/restaurant and in the next five years, I want to be the one high-end Latino restaurant that everyone has been searching for here in Northeast Ohio. Learn more about Melendez Catering Services, LLC at melendezcatering.com. Then, come watch Jose pitch his business live on December 5 for a chance to win up to $10,000 at the Core City Cleveland Entrepreneur Showcase.